Why music? Why start so young? Viewed by some as simply icing on the cake, music is so much more! Our propensity for making music is universal and it’s one of the uniquely human ways that we express ourselves, throughout every stage or our lives. From our cooing as infants, to the rhythm of our heartbeats, to the childhood chants and songs we create and sing, to the music we use to celebrate special events and recall memorable occasions, we are musical beings. Making music uses every part of who we are – our voice, feet, hands, memory, emotions, imagination, breath, voice, heart and soul. What other learned life skill can make such a claim? 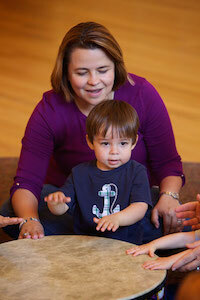 Active music-making nurtures cognitive, physical, language, social, and emotional learning. It comforts us when we’re sad, soothes us when we’re upset, energizes us when we’re tired, inspires us when we’re indifferent, and aids us in creating bonds with those we love and we have the playlists to prove it. Every human being has the right and the capacity to be a music maker. Without melody and rhythm, where would we be? The world would be an awfully quiet place. To learn more about why research is the touchstone of the Music Together® program, we invite you to read on. As part of its ongoing research and development in early childhood music, the national Music Together® organization operates a "lab" school in Princeton, NJ. Both Music Together and the Music Together Princeton Lab School are committed to helping families, caregivers, and early childhood professionals rediscover the pleasure and educational value of informal musical experiences. Rather than emphasizing traditional music performances, Music Together encourages family participation in spontaneous musical activity occurring within the context of daily life. Music Together recognizes that all children are musical and that every child needs a stimulating, supportive music environment to achieve basic competence in the wonderful human capacity for music making.